You've decided to start your own garden. You're doing more than growing food for yourself, you're making the air healthier, the earth greener, and the environment pure. So, when it comes to the tools you use when you're gardening, it's important that you buy tools that believe in your values. At GreenEase, we're not just on your side, we're on the side of the environment. We know how hard you work to keep the earth green and we want to provide you with the best tools to help you do it. 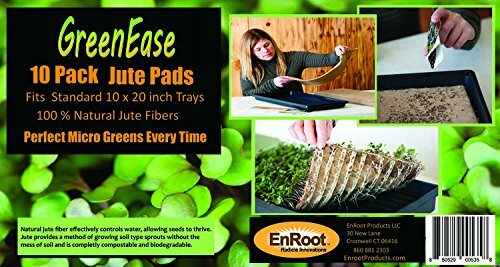 Green Ease Microgreen Pads are not only a great way to get the best results from your garden, they're made with the earth friendly, organic materials that work with nature to yield the optimal outcome. They fit into standard 10 x 20 trays, are made from 100% natural jute OMRI Jute fibers, and are completely compostable and retain moisture and minimize environmental impact and water usage. Plus, they're a cleaner alternative to soil, providing a perfect base for growing nutritious organic micro greens and wheat grass. Simply follow the directions on the package, and you'll be reaping what you've sown in 10 to 15 days. Completely organic, natural, and ecofriendly, GreenEase Microgreen Mats make your life greener and easier. Cut with scissors to harvest. You'll be enjoying the benefits of your own home grown micro greens in 10 to 15 days. NUTRIENTS: Microgreens pack as much 4 to 40% more nutrients than their fully matured counterparts and they best when harvested within 14 days! MAXIMUM WATER ABSORPTION - Optimal water retention means less watering. Save more water with each use. COMPOSTABLE- All natural organic material is completely compostable and minimizes environmental impact. EASY TO USE - Mats fit into any standard 10 x 20 trays and provide the perfect base for growing nutritious Microgreens. If you have any questions about this product by EnRoot Products LLC, contact us by completing and submitting the form below. If you are looking for a specif part number, please include it with your message.